Ezekiel 39:4-6 You shall fall on the mountains of Israel, you and all your hordes and the peoples who are with you. I will give you to birds of prey of every sort and to the beasts of the field to be devoured. You shall fall in the open field, for I have spoken, declares the Lord God. I will send fire on Magog and on those who dwell securely in the coastlands, and they shall know that I am the Lord. At some point in the future, Russia is prophesied to invade Israel. The results are noted above in Ezekiel 39:4-6. See Ezekiel 38-39 for complete details. The Bible and ancient historians point to the fact the land of Magog is modern day Russia. Gog is their leader. See attached post. Russia has recently moved military troops, naval hardware, and air support into Syria which is north of Israel. 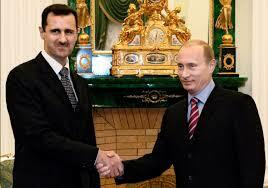 Russia says they are supporting the government of President Assad of Syria. Russia is present to fight against ISIS and terrorism. Secretary of State Kerry has warned Russia not to interfere with the fight against ISIS. Two Lebanese sources said the Russians were establishing two bases in Syria. One is near the coast and an operations base further inland. The Russians have installed modular housing units for hundreds of people at the airport. Portable air traffic control equipment has been placed. It is important to understand Syria’s President Assad has the support of Iran. It remains to be seen if Vladimir Putin is “Gog”. If he is, Vladimir’s history has been written by a Hebrew prophet roughly 580 years before Christ. From our standpoint (September 2015), this was written approximately 2,600 years ago. If Putin is “Gog”, he is like a fish being reeled in by the Lord Himself. Ezekiel 39:1-2 “And you, son of man, prophesy against Gog and say, ‘Thus says the Lord GOD, “Behold, I am against you, O Gog, prince of Rosh, Meshech and Tubal; and I will turn you around, drive you on, take you up from the remotest parts of the north and bring you against the mountains of Israel. Gog’s fate is sealed in Ezekiel 38-39. This entry was posted on September 16, 2015 at 10:26 PM and is filed under Ezekiel 38-39, Prophecy, Trend Update with tags Assad, Ezekiel 38-39, God, Gog, Israel, Magog, Russia, Syria, Vladimir Putin. You can follow any responses to this entry through the RSS 2.0 feed. You can leave a response, or trackback from your own site.